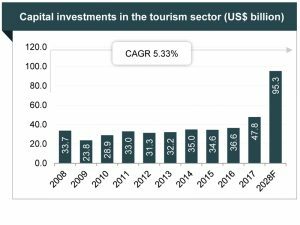 India’s tourism sector attracted capital investments of US$ 47.8 billion in 2017 and is expected to reach US$ 95.3 billion by 2028, according to World Travel & Tourism Council’s (WTTC’s) Economic Impact 2018 report. International hotel chains are increasing their presence in the country, as it will account for around 47 per cent share in the tourism and hospitality sector of India by 2020 and 50 per cent by 2022, increasing from 44 per cent in 2016. Berggruen Hotels is planning to add around 20 properties under its mid-market segment ‘Keys Hotels’ brand across India by this year. Hilton plans to add 18 hotels pan India by 2021, along with 15 operational hotels under its brands namely, Hampton, Hilton Garden Inn, Conrad, Hilton Hotels & Resorts and DoubleTree by Hilton. Marriott International also plans to add 20 more properties to its existing portfolio of 98 hotels in India. 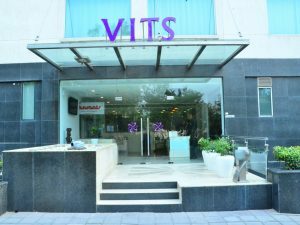 VITS Luxury Hotels has unveiled ‘VITS Mango Blossom, Gurugram’, a luxury corporate hotel located near Udyog Vihar Industrial Hub. Well-connected through railways, road and air to all major cities, the hotel offers ease of travel and transit to all the corporate travellers. 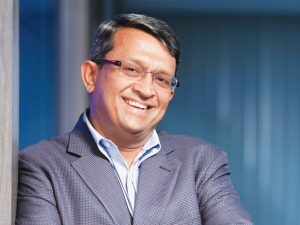 Announcing the launch, Chandrakant Shetty, CEO, VITS Luxury Business Hotels says, “We are extremely upbeat on the exponential growth prospects in Gurugram that has fuelled demand of upscale mid- market hotels in this region. The city has seen steady growth in inflow of business travelers in the last two decades but there is still acute shortage of upscale mid-market hotel rooms. We are extremely delighted to bridge this gap with the launch of our first property in Gurugram. We believe VITS Mango Blossom with its strategic location, imposing décor, banqueting and host of hospitality will appeal to both leisure and business tourists”. The well-furnished accommodation blends contemporary design with unmatched comfort. The 37 guest rooms comprising Deluxe and Superior rooms present a corporate sojourn with impeccable amenities. Mirroring the aura of elite class living, each of the rooms boats of tastefully adorned décor, upscale comfort, luxury ambience and exclusive facilities. Chennai welcomes its seventh AccorHotels property with the opening of Novotel Chennai Chamiers Road. The property is conveniently situated in the heart of the city within walking distance of many clubs like Madras Club and elite neighbourhoods like Boat Club. It is a mere 10-minute drive from popular locations like the T Nagar shopping district, Marina Beach and the business districts of Nungambakkam, Egmore, Adyar, Mylapore and Alwarpet. The hotel is less than a 30-minute drive from both the Chennai International Airport and the Chennai Central Railway Station. “We are excited to partner with AG Hospitality to launch Novotel Chennai Chamiers Road and look forward to a fruitful partnership. The opening of this hotel marks our seventh hotel in Chennai and eighth property in the state of Tamil Nadu. Chennai is fast becoming a key market fuelled by both strong business and leisure traveller growth in an improving economic climate.” said Jean-Michel Cassé, Chief Operating Officer – India & South Asia, AccorHotels. Novotel Chennai Chamiers Road is the first Novotel with a contemporary design and interiors. The hotel has been conceptualised by SODA, an international design firm known for creating fresh, innovative yet sustainable spaces. The hotel features around 100 well-appointed rooms including four suites, as well as rooms designed for the specially-abled. ITC Hotels has announced the addition of ITC Kohenur in Hyderabad as the 12th hotel to join its luxury portfolio from today. 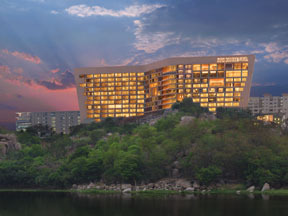 Located in the heart of Hyderabad’s new business district overlooking the picturesque Durgam Cheruvu Lake, the hotel endeavours to create ‘rare and priceless’ experiences through its super-premium offerings – 271 high technology-enabled rooms, suites and service apartments, six culinary brands, meeting and convention spaces, and Kaya Kalp spa. Located in HITEC city, the architecture and design of the hotel mirror the facets of the feted jewel by bringing to life art, culture, cuisine and heritage of the region in a contemporary milieu. Inspirations range from the striking boulders of Hyderabad to the famous Bidri work, showcase of local arts and crafts to presenting the rich culinary legacy of the region. A stand-out in-room tech feature is the amalgamation of all services through the E-Butler iPad. The hotel also features nine versatile meeting, banquet and conference spaces. This includes the pillar-less Deccan State room, which can be divided into two separate halls, each with its own pre-function area. The hotel also boasts of two sprawling outdoor venues, the Pearl Deck & the Golconda greens that are perfect for a range of theme events, corporate functions, celebrations and parties. Ginger Hotels, operated by Roots Corporation, has signed a new hotel in Jhansi, Uttar Pradesh. This will be Ginger’s first hotel in Jhansi, a city that is amongst those selected for the ‘Smart City’ initiative by Government of India. 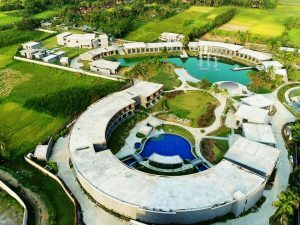 Ginger Jhansi will have 76 rooms, an all-day diner, and a meeting room. Located exactly opposite the railway station, the proposed hotel is a convenient option for travellers visiting the historic city of Jhansi for business or leisure. The hotel is a greenfield development and is slated to open by late 2020. “We are delighted to partner with Khard Hotels for the new Ginger hotel and to set foot in the historic city of Jhansi in Uttar Pradesh. This will be the first branded hotel in the city,” says Deepika Rao, Managing Director & Chief Executive Officer, Ginger Hotels. 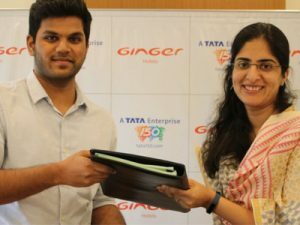 The Ginger portfolio has 45 operating hotels across 32 cities, with another eight hotels in the pipeline. The Indian Hotels Company, of which Roots Corporation is a subsidiary, has five hotels in the state of Uttar Pradesh – The Gateway Hotel Fatehabad Road Agra; Vivanta and Ginger in Gomti Nagar, Lucknow; Taj Nadesar Palace Varanasi and The Gateway Ganges Varanasi. Hyatt Hotels Corporation has announced the rebranding of Hyatt Bangalore MG Road to the Hyatt Centric brand, marking the brand’s first hotel in India and 23rd worldwide. The Hyatt Centric brand targets millennial-minded travellers who want to be in the middle of the action. 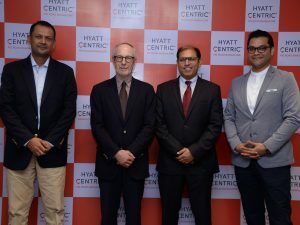 “We are delighted to introduce the Hyatt Centric brand to our guests in India with the opening of Hyatt Centric MG Road Bangalore,” said Sunjae Sharma, Vice President – Operations, India, Hyatt. 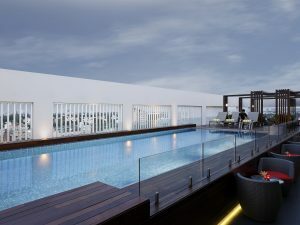 “Based in the hustle and bustle of Bangalore’s city centre, we are confident that Hyatt Centric MG Road Bangalore will serve as a platform for guests to easily explore and share all that is vibrant, and exciting, about the garden city. The launch of a Hyatt Centric hotel in India strengthens Hyatt’s portfolio in the country and highlights our commitment to offering the authentic experiences guests want.” Designed by Studio HBA, the hotel boasts a contemporary feel with eclectic touches that capture the city’s cosmopolitan vibe. Its 143 contemporary and playful guestrooms, including four suites with terrace gardens overlooking the aquamarine blue pool, have been stylishly redecorated and infused with local flare. With features like complimentary Wi-Fi and a 48-inch flat-screen TV, each guestroom offers the perfect setting to relax after the day’s adventures.